We recently received an e-mail from Si, an employee of the 4 Continents. He was slightly dismayed by our somewhat negative review and suggested we have another try. Even though restaurant critic and filmmaker Michael Winner wouldn't give somewhere the benefit of the doubt we at thisishaywardsheath.com always try to be fair. We decided to take another look to see if there have been any improvements marking in the same categories as before. 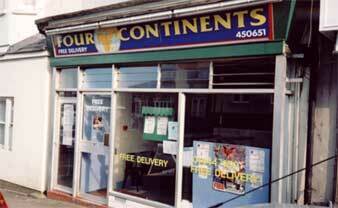 As the 4 Continents premises haven't moved, all the same positives from the first review still apply. Good location from the station, open 'till 1am and delivery to your door are all still welcome features. For consistency we visited the 4 Continents at the same time as the last visit, 11:30pm on a Friday. Unlike a typical Friday night at Ephesus there was only one other customer and he was ordering a burger so he doesn't really count. We found this surprising, as the establishment has been open for a good 6 months. Though polite, the welcome was somewhat lacklustre. We were pleased that this time they hadn't run out of doner meat so they could fulfil our order of 2 small doner kebabs however the speed of service left a lot to be desired. Even sporting new kebab technology in the form of and electric doner meat shearer it took at least 15 minutes and 2 members of staff to prepare our order. They even ruined one pita bread by over cooking it and had to start again, which in our minds is unforgivable. Overall we feel that despite there being enough meat to fulfil our order, the almost catatonic service and ruined pita results in a slightly lower mark being awarded. Previous Mark 6 Heathpoints TM - slipping a place to a New Mark of 5 Heathpoints Having enough meat doesn't make up for a snail's pace service. The price for a small doner was £3.25 and was clearly marked on the board as such. However the same kebab in Ephesus is 15p cheaper and you get far more kebab for your money. The 4 Continents small doner was more like a minute doner. That being said, at least they've done away with their erratic pricing strategy. Previous Mark: 4 Heathpoints TM - climbing slightly to a New Mark of 5 Heathpoints - Better pricing strategy but lots of room for improvement in the size and quantity of kebab for your money stakes. Again to keep things fair we subjected these doner kebabs to the same travel time to test if their ability to keep warm. Sadly, due to the fact they were poorly wrapped in serviettes and not dedicated wrapping paper and bag they again were cold by the time they reached their destination. Things did improve however, most likely because we elected to try the kebabs with a mayonnaise topping as opposed to chili. The pita bread was nice and soft but we did have the same concerns as last time over its ability to stay together if containing more greasy meat. The salad was nice and fresh and the meat tasted as if it was fully cooked this time, which were all bonuses. Full consumption of the kebab was completed this time but as mentioned earlier, the size of the kebab left us wanting more, something never experienced with an Ephesus Kebab. All in all a general improvement and certainly a step in the right direction. General improvements all round in terms of pricing strategy and the kebab itself. The electric kebab meat shearer is a much-welcomed feature in terms of innovation but we are traditionalists here at thisishaywardsheath.com and appreciate the true skill and artistry associated with the kebab blade. Where the 4 Continents have let themselves down is in their attitude and speed of service. We acknowledge their range of other take away goods including pizzas and burgers but for us, it's kebabs that matter. At this juncture, in our minds Ephesus is still king of the take-away kebab and will remain so for a rather long time. We encourage the 4 Continents though to keep up the good work, we will review again in a few months time. In the meantime, If you have experienced a kebab from the 4 Continents or anywhere else in Haywards Heath (there are only 2 others we know of) then why not mail us with your comments.